As I prepare to head off for Shrewsbury again, I realise it is a week since my last post. Viv has kept me busy for nearly a fortnight now, and stopped me spending too much time in front of the computer. Although busy at home and in the garden, there has been plenty of time for dancing. On Friday we had the technique class with Hayden at Pant. It seemed to go down well, but everyone was exhausted afterward and few stayed long for the practica. Saturday and Sunday are still reserved for our social ballroom and sequence dances, but Monday we were back at Stanley Palace for our regular date with the ghosts. I think they are getting a bit heavy footed as the floor was being rained on by small bits of plaster. Perhaps Anne Boleyn dropped her head when walking the gallery or maybe some duelists of old were still fighting it out, who knows, but they were quiet while we were dancing anyway. Our beginners are getting the hang of the cross, even managing to know the difference when I just walk on the outside. They were left to it in the other room with Viv as we were a man short for the improvers. More secadas were on the menu for tonight and I was enjoying myself. Sharon was not going to let that continue and insisted in a practice hold, to stop the men leading with their arms. My problem is that when I do not have the embrace my left shoulder drops back, the very thing we are trying to avoid, so with the practice hold I am not a happy bunny. I did not realise why this is happening until Wednesdays I will say more on this in a while. We continued the mad dance week on Tuesday, by heading off to Manchester and the afternoon tea dance at the Trafford Centre, free parking, free tea and coffee, free raffle, and a free dance with a four piece live band, what more could you ask? Well free petrol, OK, you can’t have everything. We rushed back to Chester afterwards, a Quick meal, then off to Salsa Classes. Wednesday, we decided to go back to Gobowen for Sharon’s tango. Now that Deryck and Geoff have retired there is nothing to keep us, so we will go as and when the mood takes us now. Sharon continued with the secada scheme, and again I was cursed with the practice hold. Now though I think I have found the answer, I simply hold my arm up as if I am in the embrace. It looks a little odd but it works for me. At The lantern, on Thursday we continued again with the much of the same. This is not so much drilling, as there is a different crowd at each venue. There are not many who will travel to all three, even I cannot normally manage. But it works well as if you miss one venue, you can go to another and keep up with what is happening. Anyway Shrewsbury is about the after tango drink now. We simply cannot think of travelling that far and not going to The Coracle. Tonights discussion soon moved on to matters tango, and we had a lively debate on contra posture and dissociation. One of us is missing something, I won’t say who said what, I will simply pose the question; Is dissociation contra posture? or is contra posture moving the body and legs together, but in opposite directions, and dissociation moving the body and legs separately? Viv ended up screaming with laughter as Dave and myself walked up and down The Coracle demonstrating dissociation and contra posture. At least we kept the locals amused. I was supposed to be in Argentina now, still Viv is doing her best to ensure I still enjoy myself; I have so far burnt off the garage door frame and repainted, pressure blasted the front of the house and repainted that, painted the bathroom door, and cut down a tree. I still have time for tango though. The Monday class went ahead as usual and for a change I was needed in the intermediates. Sharon was teaching a secada, which gave me some fun things to do. Not content of course with doing as she said, I managed to do multiple sacadas and even do it the other way around. I could of course only do this with those ladies who had a fair bit of experience, but it helped in a debate I had later in the week. One of our ladies was a bit unsure about attending the workshop on Friday, she felt that what she needed was more moves and not more technique. My view, and I made it plain, is that if you are following, it can be a positive disadvantage to know moves. If the technique is good on both parts, the follower will do what is required, even if, or should I say especially if, she does no what is coming next. I have danced with many women who think that they can dance, and once I start they go off on their own doing what they have been taught. This is not tango. That is why I so love dancing with the women of Chester and Shrewsbury, they assume that I know what I am doing (fools) so they follow me, even when in the class I do something different to what has been taught.It looks good and feels good, even when it does not go quite according to plan. So convinced that her technique is what allowed her to do things that she has never done before, that is another who will be attending the technique class on Friday. We debated whether to attend Gobowen on Wednesday, but decided to support Steve on his first Wednesday at Ewloe. The days are numbered I think, without Deryck and Geoff I think that something is lost, I am not ready to abandon the club totally but I may miss one or two and keep my eye on the Gobowen scene a bit more. Of course as I am off work I can also attend Shrewsbury as well. We missed most of the beginner’s class as usual, but sat at the back I was able to see one or two having difficulty. Sharon has now started teaching the basic eight. The debate rages as to whether this is a good teaching method, but I well understand that many of the guest teachers use this as a basis for further teaching, so a knowledge of the eight is quite important, they do not want to waste half of a workshop going over basics, also it is a good introduction to the cross. So I was able to spend some of the practica time with one or two helping them over their problems, I worry sometime though; Am I trying too hard? Do they start to think, why doesn’t he go away and leave me to try on my own? I think I would. I do not want to become one of those people who interfere all the time and push where it is not wanted. I had a chance to redeem myself later, I was not needed int the intermediates, so I was off to the back room to help with some beginners. Later I was to find that Sharon was doing something which was new to me, she brings a lot of good stuff back from Nijmegen I always seem to miss the best of it, ah well such is life. Dave was in the back room giving one to one to a leader, which left me with a couple consisting of a lady who has struggled for some time and a man who was on his first class. I walked them round and around the room. Struggled with their posture and generally drilled them, experience has shown me that this much intensity early on pays heavy dividends later and of course they are getting the advantage of all the things that I have learned by doing so many things wrong for so long. Hopefully they will not develop any of my bad habits. The trip to The Coracle was a bit quieter this time, numbers were right down. We still had a lively debate thanks to Mike and some interesting points arose. Mike used the term a reliable dancer, to describe himself. This brought to mind the many blogs I have read from women I Argentina, they often describe how some men come onto the floor and try to practice big fancy moves, not for themselves or their partner, but to impress the audience. I have never yet met a tanguera who likes dancing like this, “a reliable dancer” is a good description, he will dance for the woman, not try to do something he cannot lead, and to hell with anyone watching. The point then was raised about when we are not dancing, of course we all sit and watch, criticise a little? well maybe, but we all agree the best dancers and the least criticised are those who keep it simple, dance for their partner and lead well. No, I am not moving away from tango again. Shrewsbury continues to be a great venue, but the after tango drink has become almost as important as the dancing. We arrive late as usual, and miss most of the beginners class. Not really a problem for us, but we are still early enough for Sharon to call on Viv to demonstrate in the class. During the between class practica I make a point of dancing with a few of the new starters. A thing that I am finding more and more, is that the newcomers are filled with terror when I dance with them. I really do not know how to ease this, I try of course, by telling them if they “go wrong” then it is probably my fault, I just don’t think they believe me. I will come back to this later. In the main class we did a bit more of Sharon’s whoosh, again many tried to make it more complex than it was. She was very patient with everyone and eventually they all got it. Cross system walking seems to give everyone a problem, I noticed that all the women (not picking on them, it’s just that I did not dance with the men) had difficulty dissociating on the closed side, they were fine on the open side, why is this I wonder? We danced through untill the end, I tried as usual to get round as many as I could, not just my favourites, but I am afraid I still missed a few. Too soon it was time to depart for The Coracle, from now on to be known as The Shrewsbury Debating Society. As usual the conversation revolves around dancing and interestingly we spoke of a party that a few here had attended; the pressure to hold the line of dance has become so strong from the tango that people were disco dancing in the line of dance. Mike then came up with a classic line, he said ” I never could waltz, but I moved around the room in a waltz like way, and the women loved it”. You have to admire him for trying, but isn’t this what we do in tango? When you stop worrying about the steps and simply move around the room in a tango like way, you relax, you feel better and more confident, and the women love it, they do not know if you learned that move with Giraldo Whatshisname or Estoban Thingy, they simply enjoy your movement (provided of course it is to the music). Talking of the music, do we give the customer what he wants? I had a customer ask for Gotan next week, I of course was horrified. The camp splits a bit here, I must admit, but, if you are to dance traditional tango you need to know where the music is going. Traditional tango music follows a set pattern, we know what is coming, and we have a beat we can follow. If we start playing modern music that does not follow the pattern, then it will confuse the beginners, annoy the traditionalists and drive away those people who dance for the music. Maybe we will lose on or two of the avant garde, but in the end I hope we will keep a solid group of people who love tango for what its own sake and not as a means to show off. Back to the frightened women, we discussed this quite fully. I as a leader often feel when leading a more experienced dancer, that perhaps she is bored with my lack of moves, so I am not surprised that some of the beginners feel nervous. We all have our crises of confidence, the only thing we can do for each other is be a little forgiving, don’t try to put everyone’s faults to right, we all need time. Teaching on the dance floor is also a good way to shake someones confidence as well as upsetting the rest of the floor. Again my own experience here is what I draw on, when we were at the first Tangomagia in Amsterdam we had little experience even though we had been at it about three years, my shifts allowed me little time to go to classes. Nobody had any patience (except the teachers, who were great) very soon I came to the point where I would not change partners, when the teacher said change Viv and I stuck like glue. Did this benefit the women the who thought that they were so great? I think not, it certainly did not do me any good, because again my confidence was shattered. I now am at the point where I realise that there are those who think they are great, and those who are great, and I think that the two are mutually exclusive. So if someone thinks that they are too good for you, it is probably the other way around. Women, I will say again if you cannot follow, then the man obviously cannot lead, simples. The final debate of the night moved on to women’s lib (womens lib from tango???) probably my fault, and as usual when something controversial comes up I was lucky to escape with my life, but hey we all choose our own way to live dangerously, and I am still here to tell the tale. It was time to make a quick exit. Things are getting good around here, I managed to attend three tango venues this week, and that did not include my regular at Chester on Monday as I was on nights. My wife, who still goes when I cannot, has actually been to tango four times. Our first trip of the week (together) was to Bangor. This is a twice monthly venue, run by John and Anna. The journey time is about an hour and a half on a good day. Normally the road (A55) is littered with road works so the time can be doubled or more, but this week we were lucky and had a clear run. Normally it is not possible to attend because of work commitments, but this week Tuesday was right in the middle of my days off. It was a real pleasure to meet up again. Anna has not been to Chester since before her baby was born, she has the same trouble we have travelling this distance. There is a class the first Tuesday of the month and a practica on the third. Numbers are down, and so to save on expense this week it is at La Casa de Anna. Anna had to finish early to attend to the baby, but in the meantime she did somewhat monopolise me. There was some giro practicing and secada practice, I helped where I could, but I was not fully aware of what they had done in their class. Unfortunately after Anna had gone, the party soon broke up, so we were back on the road home before ten, at least we arrived home at a decent hour. After nearly seven months it was a joy to meet up again and when John took his revenge for my dancing with his wife and took Viv from me for a dance it was only fair. We finished with some milongas and John took some pictures of Viv and I, thanks to Anna for sending them so soon. Our second tango session of the week was our regular trip to Shrewsbury. Sharon was teaching giros again, with the emphasis on coming out at different points. My big problem was trying not to do secadas in the middle, sometimes it is hard to go back to basics, but it would not have done for me to confuse everyone. The heat and humidity were telling on everyone so the practice session was a more muted affair than usual, and we were glad to get to The Coracle again for a drink. As usual we had a lively tango discussion again, and the subject came around to women not getting dances. 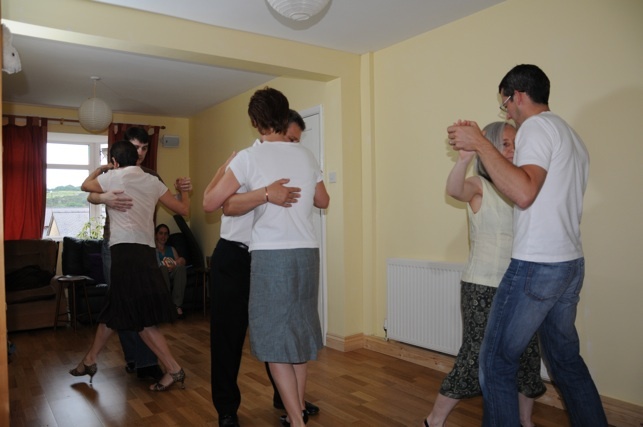 The situation here is somewhat different to Buenos Aires as most of the tango groups are formed with people who have all had classes together, but still some women do not get to dance. My feeling is that not having tandas means the men tend to circulate less, so that some women can monopolise the men and the men are embarrassed to leave them. If there is a natural break with a cortina then there is no embarrassment, you do the tanda and then sit down. Next tanda you choose a new partner, and if you do not enjoy this partner, you at least know how long you will have to dance together. We also had a discussion about the music; dancers who do other dances have difficulty understanding why I am so choosy about the music I will dance to. I learned many years ago, a type of show tango, and because it was about the moves and routine, we could do it to any music. The music was not important, we did our thing. After many years of salon tango, you learn to interpret the music, the music becomes more important than what you do on the floor, and in time, if the music does not lift you, then the dance itself becomes worthless. I tried but could not make them understand, only years of listening and dancing to the greats can make you understand. Our third session of the week is a return to The Groves in Chester. Just starting on the last Friday of the month is a regular milonga with Anthony. We arrived early; with the hot weather parking by the river is at a premium, so I wanted to be sure to get a spot. The room was not ready yet so we sat with a drink and waited. I was overjoyed to see Bill who was here with his wife (sorry forgot her name, my memory gets worse) Bill spends half the year in Palm Springs, and we used to meet regularly in Wilmslow, but have not seen each other for at least a year, probably much longer. The dancing in general was good and I managed to dance with most of the ladies, but once or twice I had to sit down. The music was not inspiring me, this group was mixed and while some were happy to be doing their ganchos and lifts in the centre of the room, for me if the music was not right, I would rather sit it out. That is not to say I spent the whole evening sitting down, when there was traditional tango playing I was never short of a partner, but I still do not understand why when there is so much good tango out there people feel the need to be clever with the music. We again had to leave early as I am up at five the next morning, I cannot complain as only five years ago I would be lucky to get one tango outing in a fortnight. The sudden increase in tango in this area is largely due to the efforts of Anthony, and for this I am grateful, but (isn’t there always a but) I wish he would share my passion for the tango greats. Tango for me is all about the music, we dance first with our ears, the feet move only in response. OK so the title is over dramatised, but it was the best way I could think to describe that Viv has gone to Bournemouth for the week, to visit our daughter, and so I have had to find ways of amusing myself that are not that different from when she is here. So I am on the lash for a week (at least when I am not working). In the Monday tango class I was again Roberta, as without Viv we had too many men again. This is fine by me, I can work on my following technique and at the same time help the men a little with their leading. One thing I noticed this time, is that often when the man is intent on his next move they do not allow time for their follower to collect before they are trying to lead the next move. I got some odd looks when I did not follow, but they were more understanding when I told them I needed time . I think that this is one of the problems with beginner classes that have no experienced dancers in them. Both partners are unable to get it quite right, and of course neither knows why. Usually on a Wednesday, we head off for Ewloe Social Club to dance to Deryck and Geoff, this group is mainly couples, and I would not have much oportunity to dance. So for this week I decided to make a return visit to Gobowen. It is a fairly small group of more or less even numbers. So when Sharon repeated what we had done Monday, I had the chance to do it all over as a leader. There was nothing new to me, but I have to admit, I still find it difficult to dance a set sequence on it’s own in a class. Some of the ladies were not happy that I wanted to dance into the move, and would not do it as a routine. They soon however got into my way, after all, their job is to follow. Unknown to me, I think the maximun that any of them had had was ten lessons, and they had never come across anyone like me before. Once I was aware how inexperienced they were I was a bit easier on them. I was however impressed with all of them, I am not sure whether it is to their credit or Sharons, but praise is due to all. After the class there was the usual practica, and we danced until just before ten, when the strain of the working day and being up from five AM finally got to me, and I left for bed. I did have one unusual request before I left; I was asked to dance as a follower because some one wanted to see. Never the shy and retiring type I was happy to oblige and let Dave lead me around the floor. By the way, I am still free tonight (Thursday) any suggestions?